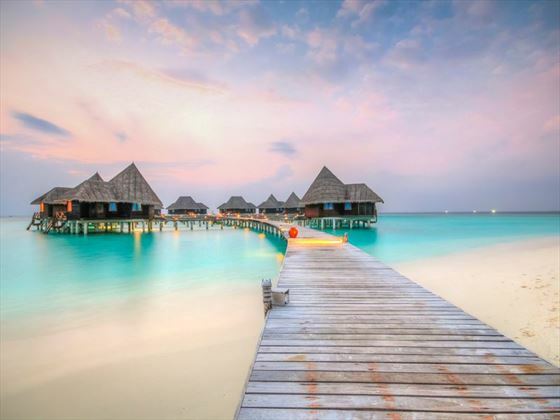 Flanked by sugary beaches and tropical scenery, Coco Palm Dhuni Kolhu is a peaceful retreat enveloped by the beautiful Maldivian landscape. 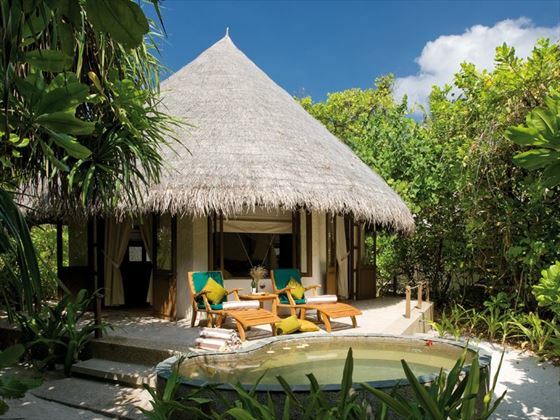 A secluded hideaway, holidays here are focused on soaking up the serene ambience and taking in the views. Whether you choose to unwind in the pool, treat yourself to a spa treatment, or hit the waters for a spot of adrenalin-inducing windsurfing, there are countless ways to relax and keep active in equal measure. 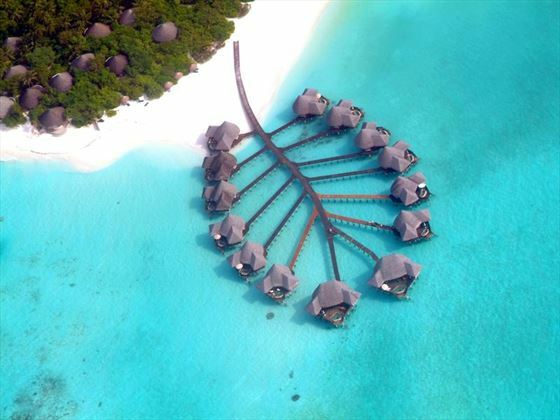 Coco Palm Dhuni Kolhu has recently won the award for Luxury Green Hotel in Maldives (2015). 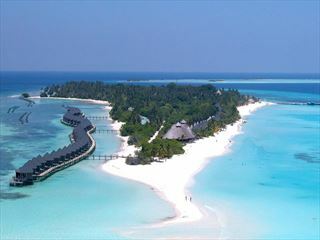 Further reading: Coco Palm Dhuni Kolhu is featured in our guide to the top 10 luxury hotels in the Maldives. 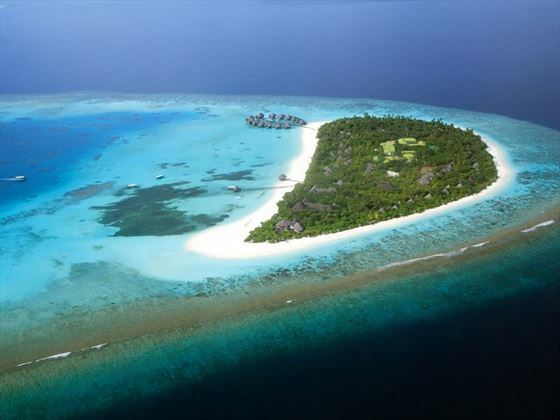 You'll find this secluded resort hidden along the southern coastline of the Baa Atoll, offering a remote setting that exudes exclusivity and unspoilt beauty. 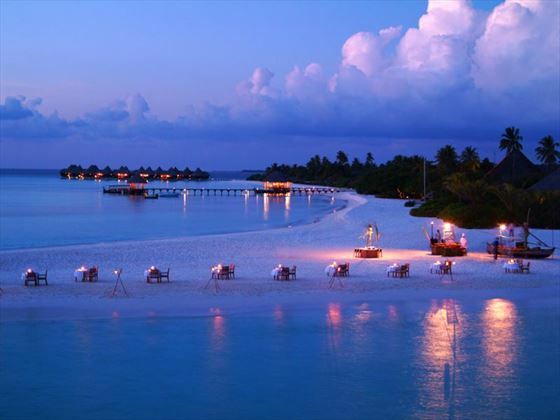 Coco Palm Dhuni Kolhu operates +1 hour ahead of Male for daylight saving time, your onwards seaplane to Male Airport will reflect Male time. 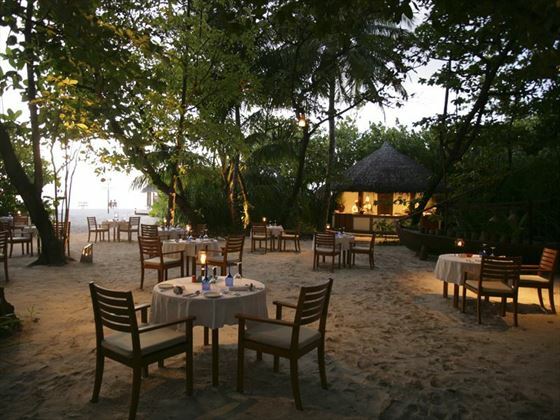 All meals (daily breakfast, lunch and dinner) in sumptuous buffet-style at Cowrie Restaurant. Large selection of tea, coffee, soft drinks, juices, water, draught beer and house wine by the glass with all meals at Cowrie Restaurant. Dinner dine around option at Cornus Restaurant (Seafood & Thai specialties) with a credit of $46 per adult and $35 per child. Unlimited access to a wide range of soft drinks, juices, ice cream & water from selected bar beverage menu at the Conch Bar from 10:00 to 00:00hrs. Large variety of draught beer, whisky, vodka, rum, gin, house wine by the glass & cocktail of the day from special bar beverage menu at the Conch Bar from 10:00 to 00:00hrs. Unlimited access to a wide range of soft drinks, juices & water from selected bar beverage menu at the Beach Bar from 10:00 to 23:00hrs. Extensive assortment of draught beer, whisky, vodka, rum, gin, house wine by the glass & cocktail of the day from special bar beverage menu at the Beach Bar from 10:00 to 23:00hrs. Afternoon tea and coffee with a selection of delectable snacks at the Conch Bar from 15:00 to 17:00hrs. Unlimited in-villa tea & coffee facilities. 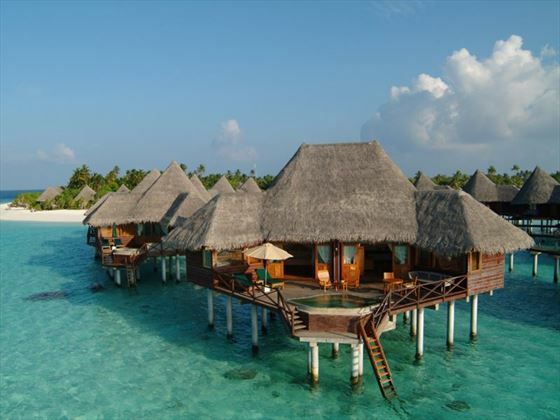 Daily supply of 1 litre of Coco Water in your villa. Complimentary snorkeling equipment (mask, fins, snorkel) per person with unlimited use until departure day. Use of non-motorized water sports equipment except for Stand Up Paddle which is chargeable. One Sunset Cruise Excursion per person per stay. All-day access to the fitness gym. 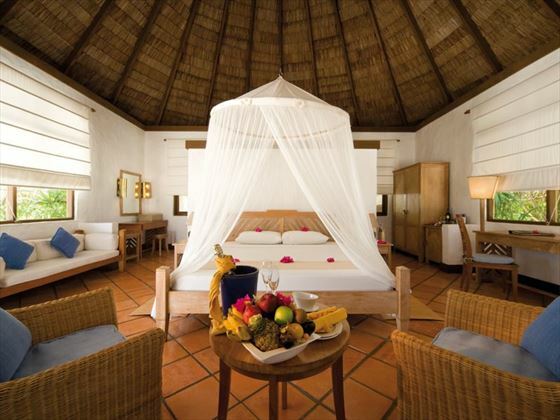 Complimentary Wi-Fi internet access throughout the resort and in the villas. Complimentary coffee, tea, juices, soft drinks, water & internet access in the Seaplane private lounge. 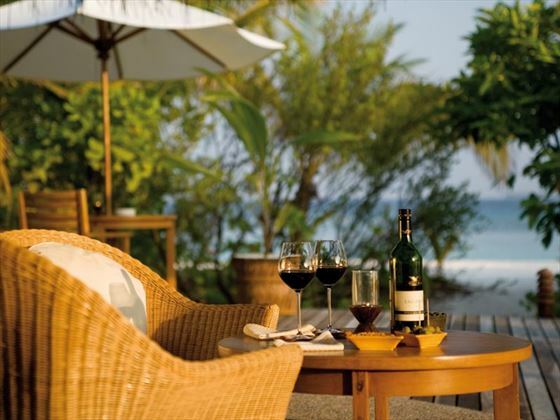 Stay in an Ocean Front Villa or Beach Villa and you will receive a refreshing welcome cocktail on arrival, a bottle of Sparkling Wine & Tropical Fruit platter, as well as a Special bed decoration and a romantic 3 course candle lit dinner (At the Cornus Restaurant). Stay in an Sunset Beach Villa or Deluxe Villa and you will receive all of the above and 10% discount on all Spa treatments. 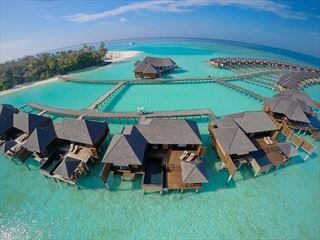 Located on Noonu Atoll in the Maldives, this luxurious lodge offers a beautiful beachside oasis, with spectacular villas fit for families and honeymooners alike. 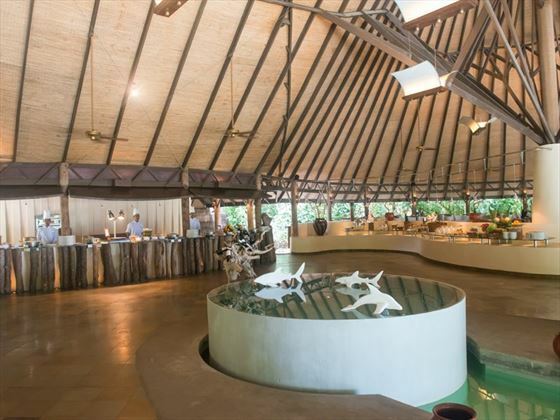 From fun water sports and lazing in the pool, to tucking into various international restaurants, this lodge is sociable and exciting.